Prosecutors Will Drop Remaining Cases Against Inauguration Day Protesters The U.S. Attorney's Office for the District of Columbia has moved to dismiss all of the remaining cases related to demonstrations on Inauguration Day in January 2017. 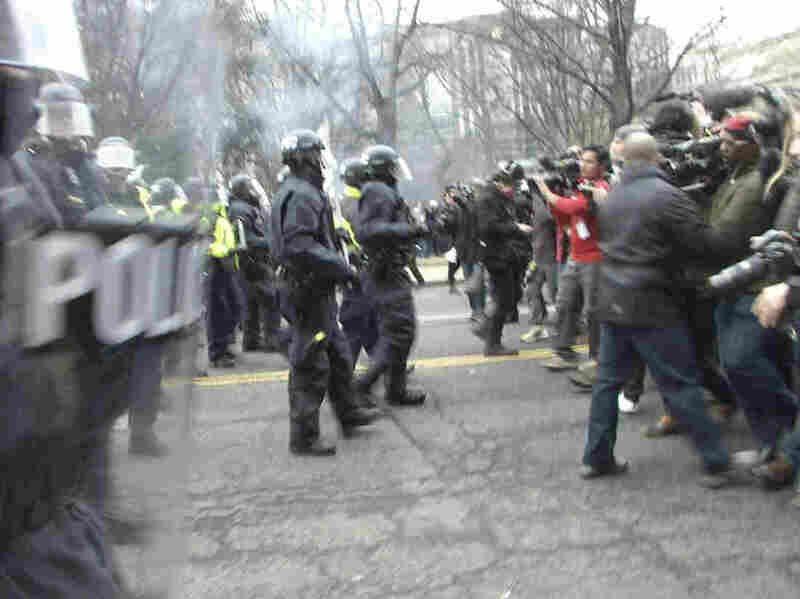 Demonstrators clashed with police on Inauguration Day last year, resulting in more than 200 arrests. The last of those cases have now been dismissed by prosecutors. Federal prosecutors said Friday they will drop all of the remaining cases stemming from the Inauguration Day demonstrations in Washington, D.C. last year. As NPR reported then, a protest turned confrontational when a small number of "black-clad protesters broke windows and police responded with pepper spray and a concussive device." In a statement the U.S. Attorney's Office for the District of Columbia said "the destruction that occurred during these criminal acts was in sharp contrast to the peaceful demonstrations and gatherings that took place over the Inauguration weekend in the District of Columbia." The statement noted that 21 people pleaded guilty to "charges for their conduct that day, including one to felony offenses." But prosecutors struggled to convict defendants in the cases that were brought to trial. The statement goes on to say that, in light of the results at trial, "the U.S. Attorney's Office has now moved to dismiss charges against the 38 remaining defendants in this matter." "I think they finally realized that they had made a big mistake," says Scott Michelman, senior staff attorney with the American Civil Liberties Union of the District of Columbia. "The charges from the beginning were overly broad, and filed against far too many people," Michelman says. More than 200 people were arrested and charged with felony rioting, though many of those cases were dropped before going to trial. While looking for evidence in some of those cases, the Justice Department issued a warrant demanding that the web hosting company DreamHost hand over all files related to a website used to plan protests called Disruptj20.org. As NPR's Laurel Wamsley reported, a Washington, D.C. judge found that warrant to be overly broad, writing that "while the government has the right to exercise its Warrant, it does not have the right to rummage through the information contained on DreamHost's website and discover the identity of, or access communications by, individuals not participating in alleged criminal activity, particularly those persons who were engaging in protected First Amendment activities." The ACLU had filed an amicus brief in support of the defendants, and has filed civil suit against the District of Columbia and its police department for officers' actions during the protests. The ACLU said police used "excessive force" and "made unconstitutional arrests" of protesters exercising their First Amendment rights.